When I was a young, I studied in Tokyo for 3 years. At that time I could not eat fish or even bare the smell of fish. 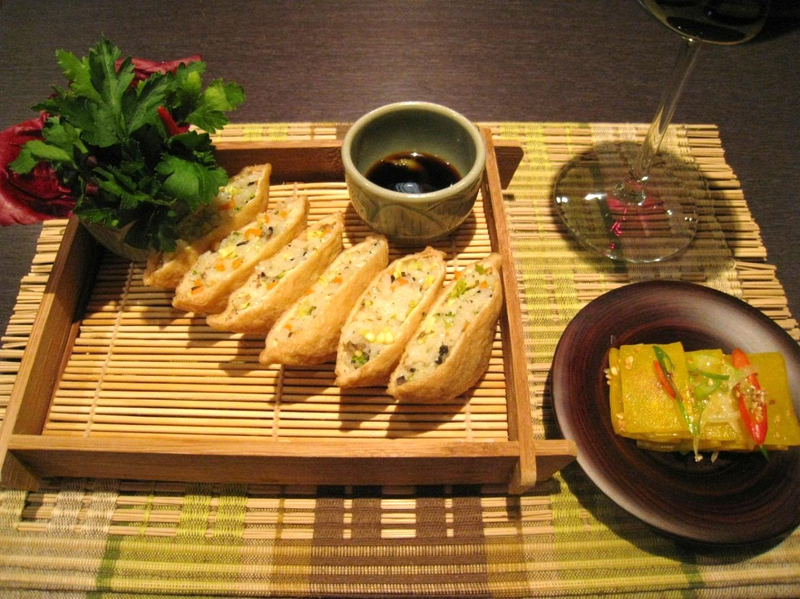 The only food I enjoyed to begin with was “Inarizushi” (Tofu pockets). I did not know that this dish was so popular in Korea until I went back. You can buy a pack of tofu pockets from a Korean supermarket. They are made in both Korea and Japan. I fill the pockets with finely chopped vegetables rather than Japanese style (Kumbu, rice vinegar, sugar, sake, mirin and etc.) This is nice served with yellow radish and chillies as in the picture. You might need to go to a Korean supermarket to buy some of ingredients such as a pack of tofu pockets and toasted sesame seeds. A spoonful of butter to stir-fry all the vegetables. Chop all the vegetables finely; use the broccoli heads and stems. Place all the chopped vegetables in a dish. Heat the frying pan for a minute on a medium heat adding a table spoonful of butter. First stir fry the Porcini or white mushrooms for 30 seconds to dry out any water. Secondly add the carrots, baby sweet corns and broccoli to stir fry further for just under 1 minute on a medium heat. Add the 2 cups of cooked rice and mix thoroughly adding the sesame oil, toasted sesame seeds, cooking salt and a pinch of white sugar. Taste the rice mixture and add salt and pepper if desired before making a tofu pocket. Take the tofu pockets out of their packet, drain any liquid and carefully squeeze the pockets. They are very delicate so squeeze them carefully to avoid tearing them. Open the pockets and gently add the filling to complete this dish.